Its that time of year again. 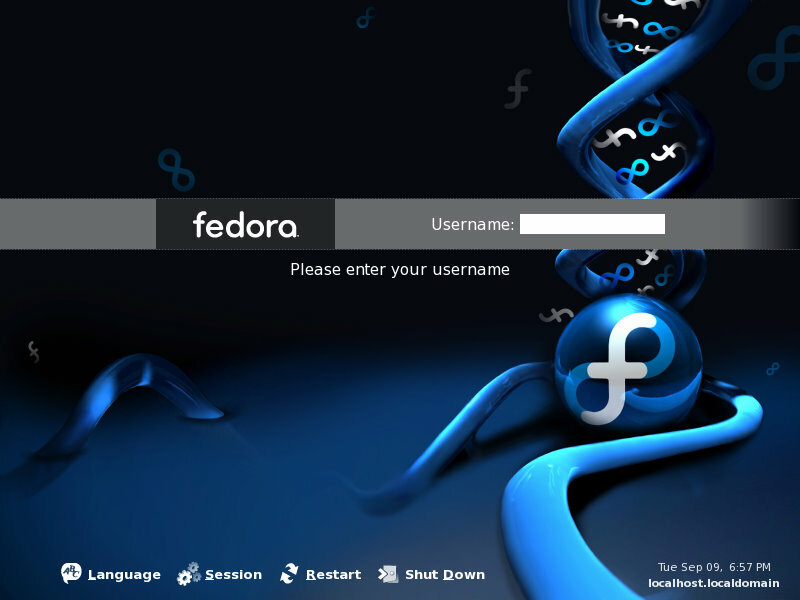 Time for the next version of Fedora Core to be released. I thought I would install the latest version of the test releases (Test 3, currently) and see what is new and exciting in the upcoming version of Fedora Core 6 scheduled for release October 24 which is just next week (at the time of this writing). Unfortunately I don't have a computer I can use to install this on so I'm doing it virtually. I will have to make some sacrifices in what I can install but if there is something interesting that is being installed by default I will be sure to let you know. I just created the virtual machine and popped the DVD into the drive so lets get started! The first thing you will notice when you begin the installation is the new artwork. I'm not sure I understand the meaning of the new artwork, but I like it. It says to me “Connected” or maybe even a DNA look. In any case, I think it looks great. The partition/disk selection looks a little different in this version. 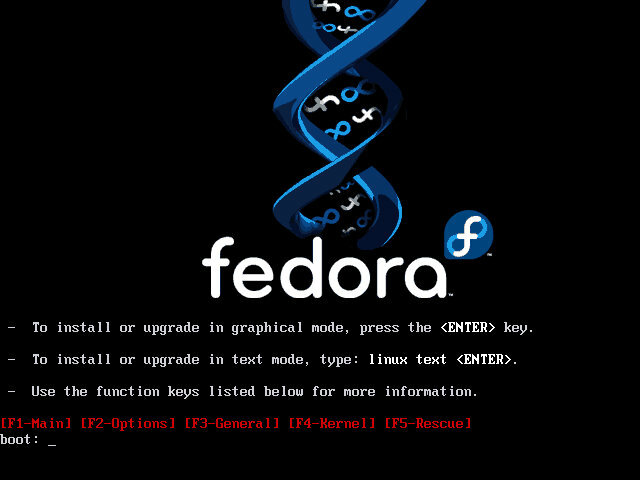 It looks as though they are trying to make it a lot simpler for people to install Fedora onto their computers. They give you the standard “Remove all partitions and install”, “Remove linux partitions and install”, etc. They also give you an advanced storage configuration option. There is a really neat feature available in the installer that I hope is carried over to the final version of FC6. If you have additional repositories that you would like to add you can add them during the installation. From my understanding this would allow you to get all of your applications installed during the installation so you didn't have to spend several hours trying to get all of your apps installed after you had installed the base operating system. I was not able to test this feature out. In fact, it crashed my virtual machine and I had to start the installation over. An interesting thing to note is that when you are telling the installation what type of system you want to install, if you choose web server or development it will tell you that an ethernet card is required. However, if you don't choose those options and move forward you can still choose those options but it will not tell you that an ethernet card is required. The only new application that I see to the lineup is that you can choose to install the Xen virtual machine monitoring software. Xen is the open source alternative to VMware or Microsoft's VirtualPC software. I look forward to reading more about it and playing with Xen, I've heard a lot about it but have not done anything with it, yet! As far as the other applications go, I don't see anything new. I do see newer versions, thankfully. I know there is always something that everyone wants to include during the installation, however, I really wish they would keep XFCE in the desktop environments. It is simple enough to install after the installation but it would be nice if I didn't have to install it afterwards. I added a couple of additional applications to the installation, it has checked for dependencies (which took forever. Granted, I am running in a virtual machine) and it is now installing. It will probably take a while since it is installing in a virtual machine so I will let that run for a while and get back with you! About 45 minutes later I have successfully installed Fedora Core 6 Test 3. Let’s reboot and do the usual first boot configuration and see if any of that has changed. During the last part of the installation which is called “first boot” you set up a user for the system. I was not able to set up a user because when I would click into the field it would enter several q's. Not sure why but again, I'm not running on native hardware and this is a pre-release version. Luckily, I can login as root which is dangerous but I think for testing we can safely log in as root and have a look around. I'm at the new login screen. It looks rather nice. It actually reminds me of some themes that I saw a while back for the Gnome login manager. I just logged into the system and am now at the desktop. I have to say, the new wallpaper is REALLY nice. I was just starting to appreciate the one in 5 but this one is REALLY nice. WOW! It makes the desktop stand out a whole lot more. Use to, the wallpaper was the first thing I would change. I like this one a lot though. The desktop icons are still the plain Bluecurve icons that have been used since RedHat version 8. They look decent but I think its time for an update. I've been looking through the menus and it appears as though there are a few new icons for some of the options so maybe they'll be some desktop icon changes in the final release. The new icons in the menus may also be a part of the latest GNOME which is in use in FC6. I've opened up a couple of application since I have logged in and I am VERY impressed with the performance. 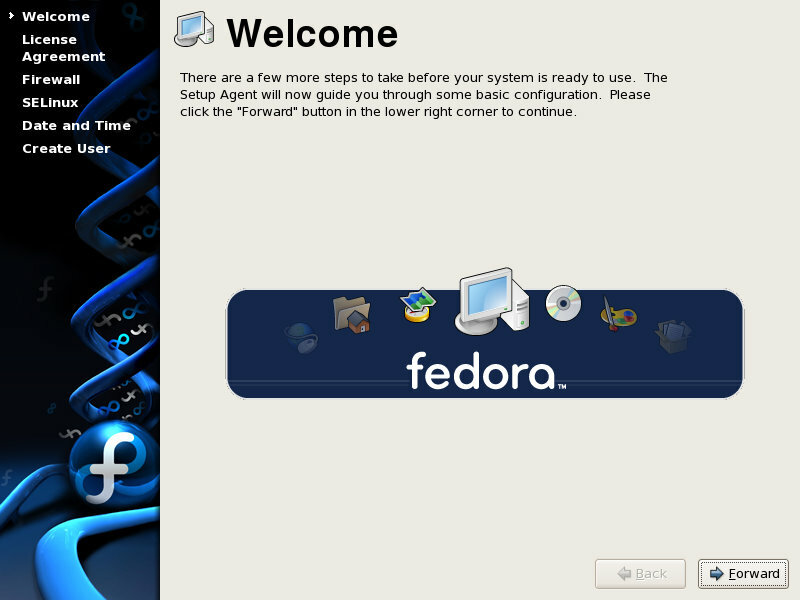 I have Fedora Core 5 installed in another virtual machine. It isn't currently running, but FC6 T3 definitely out performs FC5 in my opinion. The GIMP opened nice and fast! I only gave the virtual machine 284 megs of RAM. I bet if I installed the VMware tools package that it would be even faster! I am VERY impressed! Unfortunately, OpenOffice.org Writer and Firefox took a little longer to open. It is still a lot faster than the time it takes to open them in my FC5 installation that is running XFCE as the desktop manager with un-needed services stopped! I'm anxious to see how fast this thing runs when I disable some services and install XFCE. I know I said this in the last paragraph but I am very impressed. I thought I was going to have to make a lot of sacrifices since I was installing in a virtual machine environment. I am running Gnome, Firefox and OpenOffice.org without any problems. I've also not stopped any services that I don't need, like I usually do. I just can't get over the performance increase in version 6. From what I can tell so far I think this will be a great update to FC5. Of course, we'll have to see how many applications don't run on it yet! However, that is what you get when you want to run bleeding edge technology. 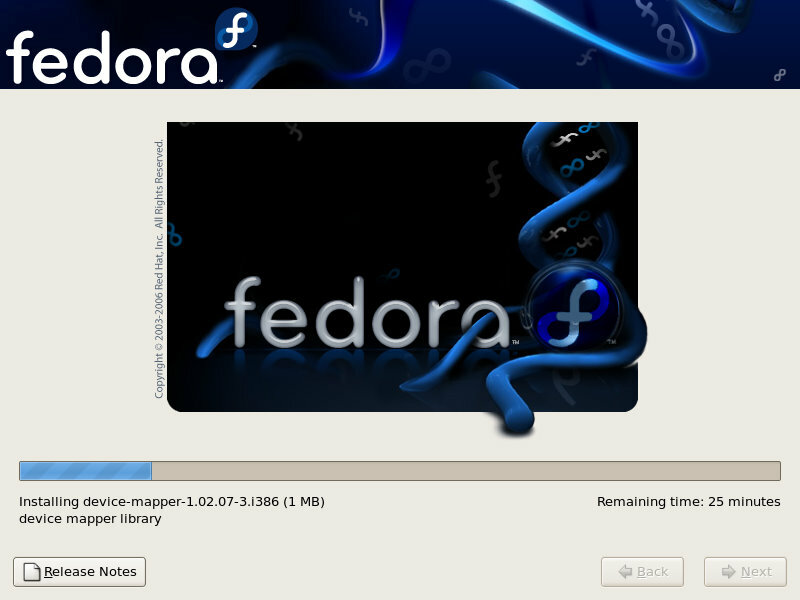 I look forward to downloading the non-beta version of Fedora next week.